Week 3 – Why it’s good to be a Queen. There are only a few low priced rooms left at Miraval for the “Self Care for the Creative Soul” retreat so if you plan to join us, don’t miss out. You can register by calling Miraval directly at (800) 232-3969. Read more about the retreat here. I’m live on the radio on Monday (1/13) at 5pm ET/2pm PT and I’ll be joined by my sister, Kerri Richardson, to talk about how we’ve transformed our health together over the last year and how you can, too. Call for coaching at (866) 254-1579 and listen here. Why it’s good to be a Queen. There are some days when I cringe at the thought of having to leave the comfort of my cozy bed. But those days are becoming few and far between. One reason is because I’ve started treating myself like a benevolent Queen. How would life improve if I thought of myself as a benevolent Queen? What would a benevolent Queen do? It’s been a fun exercise, albeit a bit uncomfortable at first. It felt a bit entitled to think of myself as a benevolent Queen. But I got over that. Quickly. My life is my Queendom. I’m in charge of what happens in this land. I’m a benevolent leader. I care deeply about people. But not at the expense of myself. Or else I become a dictator. The health of the Queen is the first priority. Daily actions that ensure the care of her body, mind, and spirit are the first to be carved into the daily calendar. The Queen need not defend the choices that honor her health and wellbeing. She rules. The Queen is entitled to regular breaks from decision-making to avoid mental and emotional fatigue. Therefore she will abstain from email, texts, and telephone when necessary and will also share the wealth by employing others to communicate on her behalf. The Queen must always be a power of example by being the example. The Queen openly and graciously welcomes visitors who are kind, respectful, self-aware, and a pleasure to be around. (If they are wickedly smart, creative, funny, and visionary in their thinking, she might even let them stay at the castle for a while). There is no mean-spiritedness allowed in the Queendom. None. The Queen must be actively engaged in the practice of relinquishing control lest she teeter on the edge of dictatorship. Beauty is a necessity in the castle, never a luxury. These laws are only the beginning. God knows where I’ll go from here. I might start wearing robes or riding horses. 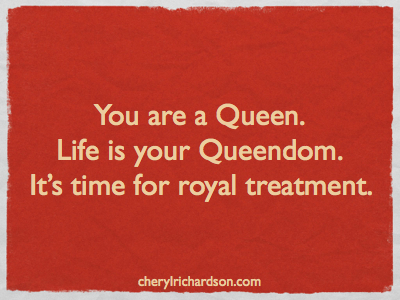 You are a Queen (or King), worthy of royal treatment. It starts with how you treat yourself. Benevolent Kings and Queens treat themselves and others with kindness and respect. Start by being nice to yourself. Check out this video here.